Thinking about milkweed summons childhood memories of collecting wild grown milkweed leaves in the fields for school. For most of my life milkweed was considered a wild ditch weed. I don't ever remember seeing it flower, but I do remember the fat seed pods bursting open with cotton topped seeds. With the decline of the monarch, we now know the importance of the milkweed to the monarch. There are hundreds of milkweed varieties, many of them blooming beautifully in backyard gardens. Although milkweed attract many insects for different reasons, milkweed was "made" for Monarch butterflies. The flowers of milkweed produce abundant nectar but the adult butterfly feeds on the nectar of many different plants as well as fruits and has no preference for the milkweed. It is of course the larvae that survives specifically and only on milkweed..
Asclepias is the milkweed genus with several lower classifications. Many gardeners are learning to grow milkweed and the trick is to find the one that grows best in your region and that is favored by Monarchs in your region. Some milkweed will do best when field grown in part because they are invasive, some will be better suited for backyard gardens. Milkweed gets its name from the milky substance that oozes from leaves and stems when they are broken open. This milky sap can cause serious eye problems if you rub your eyes after contacting the sap. Be sure to wash your hands after handling milkweed. Milkweed sap can cause skin reactions. Milkweed sap can be poisonous to animals. The sap has a bitter taste that does deter insects and animals from eating the plant. Some animals and insects will eat milkweed, but generally the toxic plant protects Monarch larvae from predators. Milkweed blooms produce large amounts of nectar, attracting not only the adult Monarch butterfly but many other butterflies and insects. Monarchs favor certain species of Milkweed. There are over 100 species of milkweed and they do not all have the same requirements for sun, soil and moisture. Ideally you will have room for at least a few, if not several, milkweed plants. Monarchs will love a mass of milkweed to lay their eggs everywhere! With these things in mind, it is important to investigate the species that best thrive in your region and the specific conditions in your gardens. The monarchs have favorites but no firm preference, so grow what you like and what will thrive. You will find different flower colors and different sizes and Milkweed are fragrant, some more so than others. 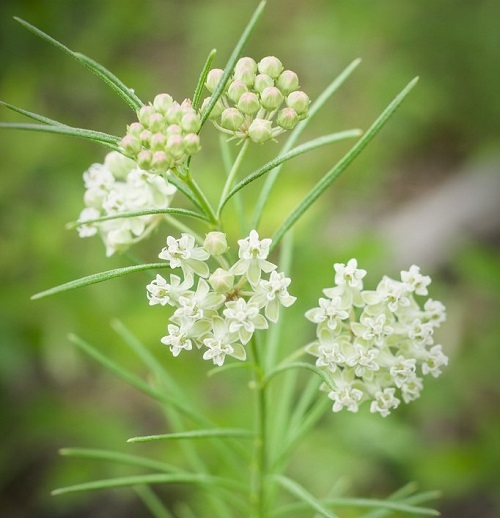 There are four different native species of Milkweed that are found in most states across the U.S. and into Canada, as well as other species that have naturalized or are grown as annuals. There are 75 to perhaps over 100 varieties of milkweed that are Native to the continent. Milkweed species are typically clump forming, the exception is the Common Milkweed. These are all native plants and perform well without fertilizing and in poor soil. Because Milkweed generally prefers dry conditions, mulching is not necessary and not appreciated other than by the Swamp Milkweed. Milkweed prefer not to be moved once the taproot is established. Swamp Milkweed in particular develops a deep taproot. Milkweed do not need to be divided. If you need to control the spread of your Milkweed be sure to remove the seed pods that form in early fall. Milkweed is not generally afflicted with pests that create serious problems for the plant. Occasional infestation of whitefly or aphids should be taken care of with a good jet of water to remove them, but be mindful of Monarch egg clusters or larvae. Obviously do not ever use a pesticide on your Milkweed as that will jeopardize the Monarchs not to mention pollinators. The Common Milkweed is what we used to see growing wild and can be quite invasive. This milkweed will spread rapidly with underground rhizomes as well as self seeding. It is native across central and eastern United States and Canada. It is tough and hardy, growing well in most soils. Common Milkweed is hardy in zones 4 through 9, but unless you have large wild gardens you should consider a more well behaved species. The plant can reach 3 to 5 feet tall or even 8 feet when growing in the wild. Common Milkweed is favored by Monarchs and has a lovely fragrance. The large round clusters of pink purple flowers appear from June through August. If you decide to grow it, Common Milkweed prefers full sun and is not fussy about the soil. Showy Milkweed is the common milkweed of the Western regions. It also spreads by underground rhizomes as well as by seed, so it can become invasive. Each 2 to 3 foot stem as well as leaf axils produces blooms clusters. The fragrant flowers are large and pretty with pale rose colored blooms. Showy Milkweed prefers dry conditions and poor soil, and insists on full sun. Swamp Milkweed, also known as Pink Milkweed, is one of Monarchs' favorites. Although this is a normally a wetland plant that prefers a moist environment, it will do quite well in only slightly moist conditions once established. As a backyard garden plant Swamp Milkweed is really quite lovely. Large rounded clusters of pink purple blooms top 2 to 5 foot long stems from June through October. Native to most of the U.S and eastern Canada, west coast is the exception. Swamp Milkweed produces a lovely flower that attracts a number of different butterflies and pollinators. This well behave Milkweed will self seed but not aggressively. It enjoys full sun to part sun but will not do well in heavier shade. Ordinary soil is quite suitable and it is hardy in zones 3 through 8. Whorled Milkweed is a much more delicate looking plant than most Milkweed and remains smaller at one to two feet tall. Flat clusters or white flowers tinged green form on the upper stem from June or July through September, a little later than most milkweed. Whorled Milkweed does like full sun and dry to medium soil but may tolerate some shade. Fragrance is very faint with Whorled Milkweed. Hardy in zones 4 through 9. 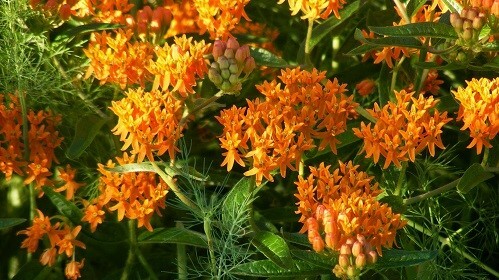 Dry sunny gardens are ideal for Butterfly Weed and poor soil is just fine. It is not at all pleased about rich moist soils so try Butterfly Weed in the hellstrip or the outer reaches of your landscape. The plant is somewhat mounded to one or two feet and is a nice choice for front of the border. Brilliant yellow orange flat clusters are abundant from May through September. Although a very lovely plant and flower, Monarchs are not particularly partial to them. But because Butterfly Weed does draw many species of butterflies it is widely grown especially where conditions can be difficult for other garden plants. With a deep tap root, Butterfly Weed does not move well, but is a reliable and self sufficient garden plant once established. This is a very long lived perennial and is hardy in zones 3 to 9. Be sure and ask at your local garden center about which Milkweed performs well in your region. A native plants nursery is an ideal source. You can plant potted seedlings from the nursery in spring, or sow seeds just like Mother Nature does in very late in the fall.